A scheme allowing GPs to "prescribe" boilers to patients in damp, cold homes has resulted in a large drop in doctors visits, the group leading it says. Patients with respiratory diseases in Sunderland made worse by the cold have been referred onto the scheme by the city's clinical commissioning group. Housing firm Gentoo, which is running the project, said participants' GP appointments had fallen by 60%. Resident Margaret Boulton said the effect was "unbelievable". Her husband John, who has chronic obstructive pulmonary disease, has not been in hospital once, compared with five or six times the previous year, she said. "We're able to heat the whole house for the first time in God knows how long," she said. Gentoo said accident and emergency attendances had also gone down by 30% . Green futures manager Paul Burns said the results "demonstrate that improving resilience to fuel poverty can deliver positive benefits to the people involved and measurable reductions in demand to all areas of the National Health Service". Home improvements delivered by the scheme also include double glazing, draft-proofing and insulation, costing about £5,000 per property. 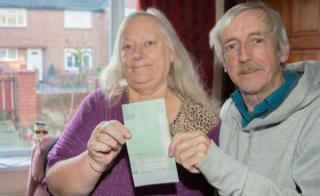 Mr and Mrs Boulton's weekly energy bill has reduced to £15-20. They previously had no boiler and spent about £40 a week on electric heaters. The project, funded by Sunderland Clinical Commissioning Group, has been running for 18 months after a successful trial and is expanding into other parts of the North East. Royal College of GPs vice-chairman Tim Ballard welcomed the results "especially in relation to patient wellbeing and the potential impact on GP workload". In March last year, the government announced funding for the "boilers on prescription" programme to be expanded across the country although it is not clear how many are considering adopting the idea.